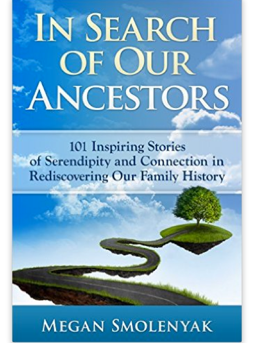 “In Search of Our Ancestors” – two thumbs up! I’ve often wondered what really drives me in my passionate search for my ancestors? Certainly the enjoyment of solving endless puzzles and the adrenaline-rushes with the thrill of the find make genealogy exceedingly fun. But is there another reason so many of us are obsessed – and may I add, COMPELLED – to learn our ancestors’ stories??? Megan Smolenyak’s book, In Search of Our Ancestors, features stories of genealogy sleuths whose experiences of serendipity have led them to incredible finds. I can certainly relate and have story after story of things that certainly shouldn’t have been. Like the time my husband and I decided to get off the highway at a small town in Minnesota. He was hungry and didn’t want to wait until we reached our destination to eat, so while he went into McDonalds, I visited a neighboring, old cemetery – and found the gravestone of a family member I had no idea was buried there! One has to wonder if it is simply serendipity or random coincidences that result in such finds, or if there is another reason that we are so often successful in unlikely discoveries such as this? Like a little help from beyond? 🙂 I thoroughly enjoyed this book, which was both heartwarming and inspiring, and think you will too!